Yesterday was the 22nd, today the 23rd, and by the time this post is finished the date will probably flip on to the 24th, which will make me two full days late in joining Christina in the celebration of Garden Blogger’s Foliage Day. I’m sure she’s fine with my tardiness but I’m also sure I didn’t want to miss this month’s opportunity to look past flowers and recognize all the contributions foliage makes in the garden. In the vegetable garden the broad leaves of late planted summer squash threaten to swamp their less edible neighbors. I love how fast they grow in the heat. I’m a big fan of large leaves and whether they’re squash or cannas or elephant ears, the more enthusiastic a grower the better! While some plants did not enjoy the recent spell of hot weather, a newer resident of the garden did. One of the larger elephant ears, Alocasia ‘Borneo Giant’, is finally putting out some more enthusiastic growth. The leaf is still barely larger than my hand but the giant part of the name gives me hope for the future! Summer is when I really enjoy the potted plants on the deck. Not only can they be enjoyed from the window, they can be enjoyed as you walk by, as you sit in a comfy seat, or from below. It’s as if you’re multitasking your enjoyment! 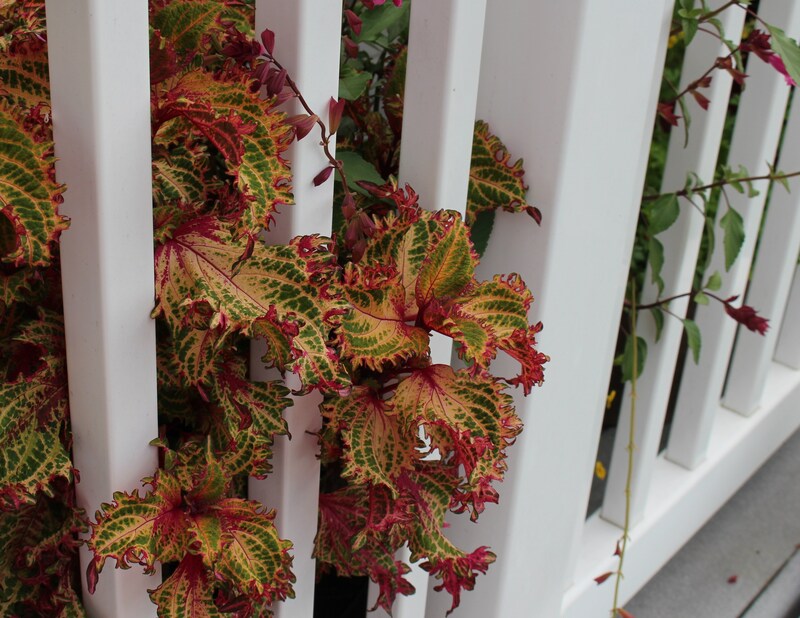 The rich foliage pattern of this coleus sometimes gets lost in a planting, but against the white railings the colors really come through. Besides showcasing my favorite plants close up, the deck is also a great place to show off the little things which get lost out in the garden. Little cacti and succulents which don’t mind a few missed waterings or weekend road trips. 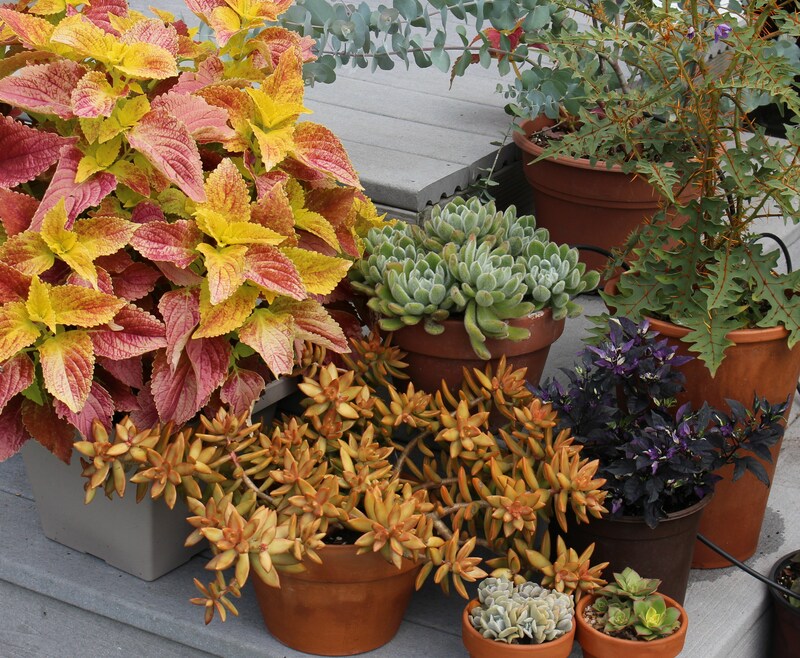 They’re all foliage and make great deck plants… which look even better if the gardener finally repots them into roomier quarters (as I did this spring, although one of this bunch already needs a bigger home). As I was walking about trying to focus on foliage, I realized this collection at the end of the deck steps doesn’t rely on a single flower to bring in the color. More succulents as well as ‘Alabama Sunset’ coleus, ‘purple flash’ pepper, and my belovedly spiny porcupine tomato. It’s really way past time to do a catch-up post on this year’s deck planters (and hopefully I can come clean soon) but there’s only so much time tonight, and there’s still plenty of other foliage to consider in the garden. For as exciting as flowers and color are, sometimes the eye needs to rest on a little green. For me chrysanthemums are a nearly indestructible planting for some of the hotter, dryer, tougher-to-fill spots which could use a soft mound of green. Usually the iris in the back has nothing but sad, browning and yellowing leaves, but this year the rain has been enough to keep it growing strong. The chrysanthemum on the other hand looks respectable for the entire summer, even when the crabgrass gives up. 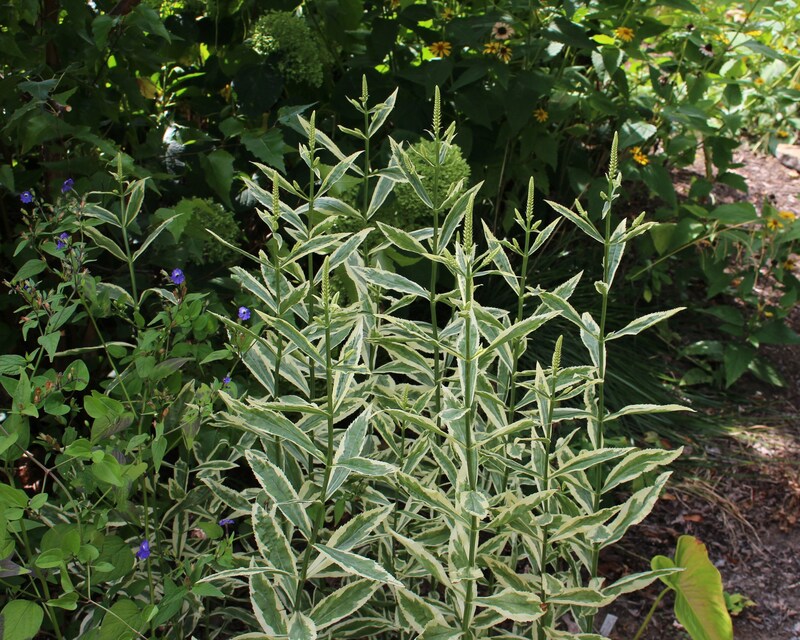 Dry sun is bad, but dry shade is worse, and this year I’ve been surprised at how well variegated obedient plant, (Physostegia virginiana ‘Variegata’) has done. In moist soil it may spread a little too enthusiastically, but here it seems downright demure, and I wonder if the straight green type would be as restrained. Physostegia virginiana ‘Variegata’ lighting up the shade. It’s a dry spot full of maple roots, but the foliage on this plant still looks great. In my only bit of non-rooty shade I can always count on the calm contrasts of foliage form and color via evergreens and hostas. Although things are beginning to get crowded here, I won’t mess with this planting until it starts to look desperate. Along the porch the hostas cover the spring bulb plantings and dwarf conifers shelter the porch without overwhelming it. 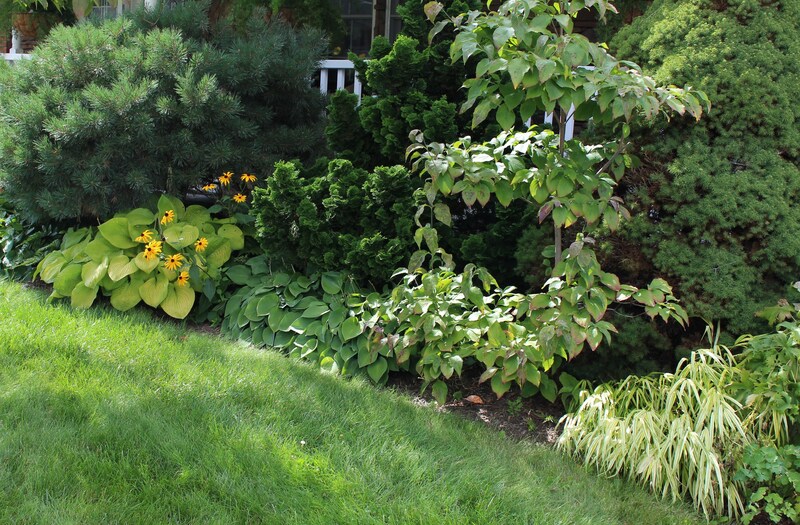 They’re all slow growing plants, but not too long ago I remember being able to easily plant between these shrubs. The calm of the shade garden is always appreciated in summer, but in sunnier spots August means flowers, and I do try for plenty of that as well. Even with all the flowers though, a good foliage background can make a world of difference. The rich red flowers of dahlia ‘Mathew Allen’ set off even brighter next to the solid mass of the red-leaved cannas. More cannas trying to keep their chin up against the tide of sunflowers which still swirls around the tropical garden. In my opinion this bed could have used a few more masses of foliage to balance out all the bloom. So there are some August musings on foliage from my neck of the woods. 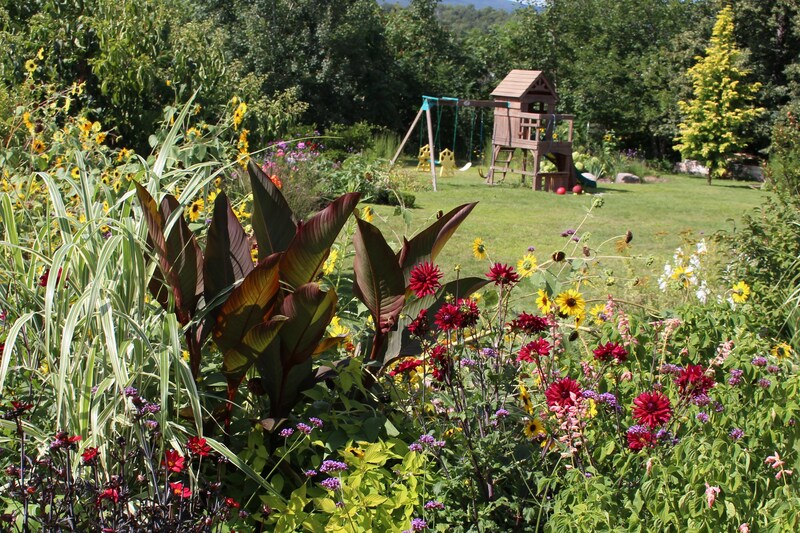 If you’d like to dabble a little deeper give Creating my own garden of the Hesperides a visit. 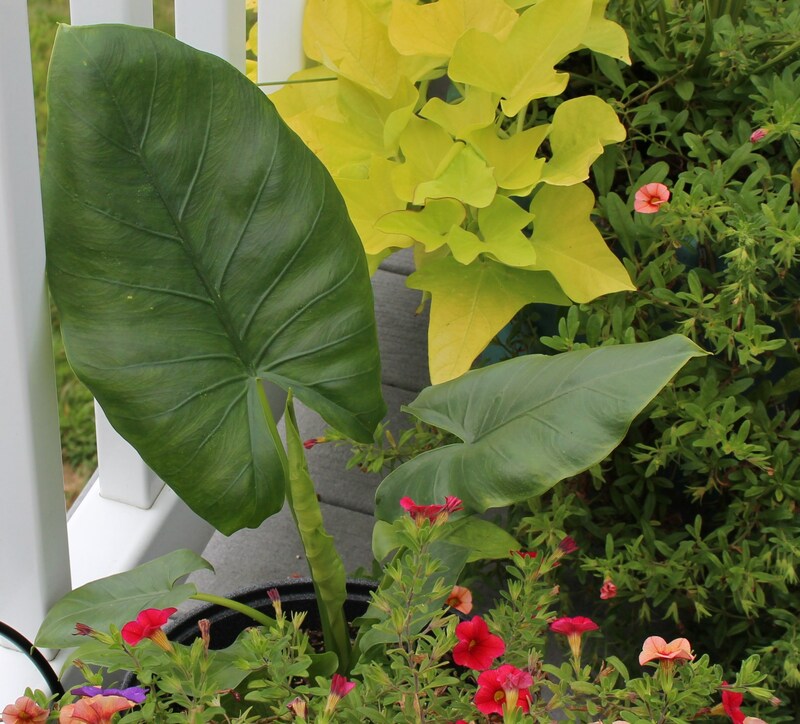 Each month on the 22nd Christina provides the platform there to host a foliage review, and I’m sure you won’t be disappointed by the foliage musings of bloggers from around the world! 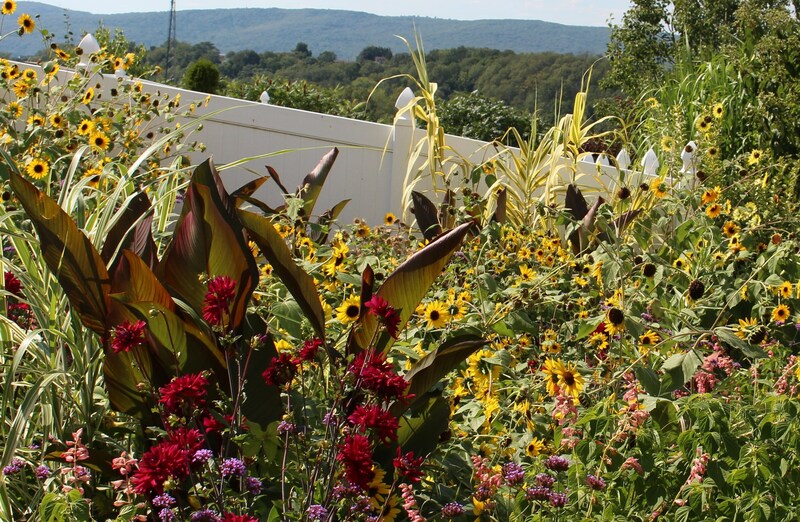 This entry was posted in annuals, dahlias, deck plantings, garden design, late summer, summer bulbs, Tropical garden and tagged deck planters, foliage plants, garden, garden design, GBFD. You know I don’t mind late entries for FD, especially when the post is as interesting as yours. You have summed up exactly what I intended when I started this meme; that is that even a border filled with flowers will look better still with good foliage included as well. 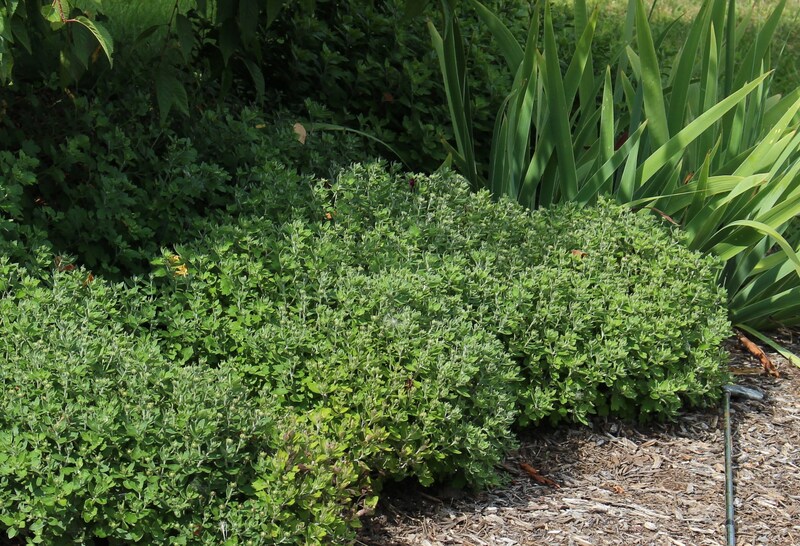 I ‘ve never thought of chrysanthemum as being particularly drought tolerant, so that’s good to know. I’ve just planted (late I know) some chrysanthemum in the cuttings beds hoping there is still time for them to flower, I’ll have to note how they respond to the watering regime as they’re in the same bed as the Dahlias. I’ve noticed it the past two years that some of my borders, particularly the ones heavy in annuals, lack a nice foliage presence. Something to work on! I hope I haven’t mislead you by saying the chrysanthemums are drought tolerant. Dry weather here may be far different than your droughts… but they have handled much drier conditions than many another plant could have. That said I’m sure they will thrive alongside the dahlias as well. I have several in the vegetable beds alongside the tomatoes and they love it. Better late than never. This one is better. Your foliage is quite varied and I enjoyed seeing how you use it. I like that collection of succulents with the ‘Alabama Sunset’. Succulents have been good to me, they’re right up my alley of next to no maintenance and yet still happy enough to continue growing. The coleus is doing well considering it’s in hot, full sun! I really like your choice of succulents. 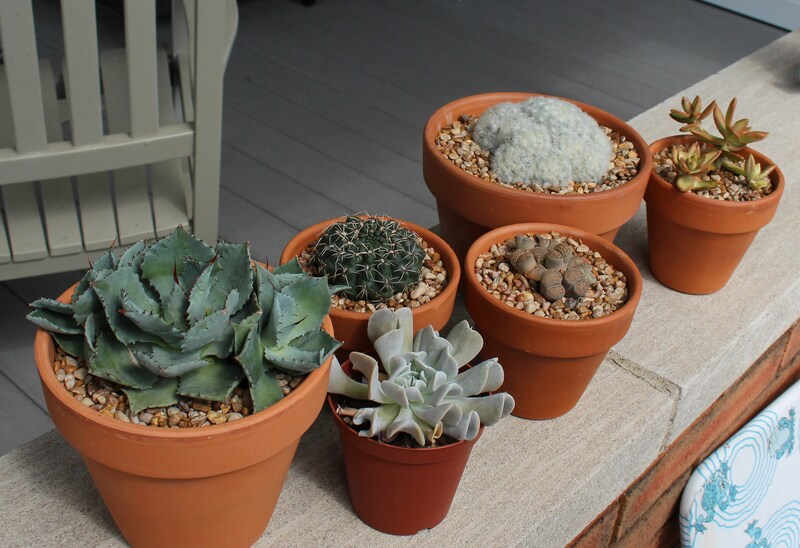 I have some potted too, but each winter I am never sure about their survival. They need so much sun and I use the grow lights for the herbs I over-winter for cooking. I used to propagate coleus, but they too got out of hand in the house, both too many and with long winters, leggy even with constant pinching. Orchids are more my speed since they like being ignored and don’t mind the cooler temps and light of winter. Haha; and I have killed every orchid I ever owned! The succulents get thrown into a cool, poorly lit area of the basement. I don’t water and they go dormant until temperatures warm up again. Over the years those which don’t appreciate this treatment have died off. Other plants are beginning to get out of hand. I put all the coleus cuttings in a few glasses of water on the windowsill where they suffer through the winter, but the other things need more attention. I’m not sure how much longer I’ll have the patience for all that. A great post Frank. You have an eye for good foliage. I absolutely love your tropical garden. The cannas and grass really set off all the flowers beautifully. Thanks Chloris, For as much as I like to complain about what didn’t go right, the flowers and foliage of what’s blooming now make me smile every day (and hope for a long, drawn out autumn). Looks good!! I can’t believe you have obedient plant growing in dry shade!! Great idea. But I think my dry shade is just too dry for it. 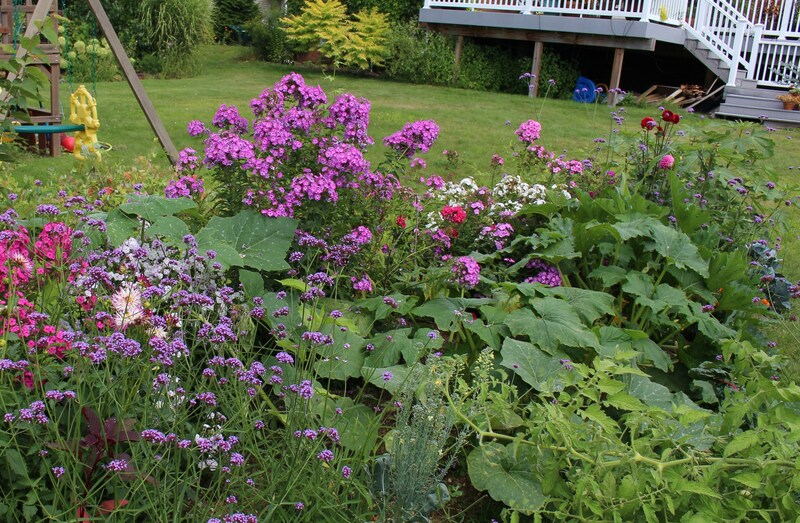 I wonder… this shade is dry enough to kill off plenty of things, yet the obedient plant still looks perfect. I’m sure it would rather a good drench of water but I’m far too lazy to drag the hose all the way over!